Bengaluru The Commonwealth Games are the old British Empire’s continued footprint in the former colonies every several years as athletes’ troop in between the Olympics, and when India hosted the games for the first time in Delhi in the fall of 2010, this was to be a star turn for the city on the world stage. The results can be seen in a number of newly built flyovers (expressways) and other capital improvements particularly in the Metro and the airport. In the wake of other problems tourism did not reach expected heights and what turns out to have been significant corruption marred the construction and the media’s spin on the games. 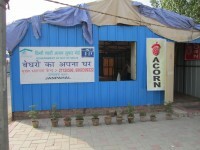 For ACORN and our work in Delhi it also meant still dealing with the forced slum removal around the Income Tax Office (ITO) and the 70,000 people that lived in the ITO slums. In the wake of the disastrous Commonwealth Games we ended up agreeing to manage a “night shelter” across from where the athletes’ housing had been built in the path of the old slums for many of our members who were bicycle rickshaw pullers pushed out of work and off the streets during the games with little livelihood and no income. When I visited in 2011 we were still waiting for the urban department to reimburse us for the staffing cost for maintaining the tent and tarp structure over that winter after the Games. Now a year later, the winter has turned into the a year round shelter, the tents have become corrugated, hard walls with solar power, water, and portable toilets, and the one shelter has become four with two on either side of the expressway around the old ITO and the huge Akshardham Temple and the Metro station of the same name in East Delhi. 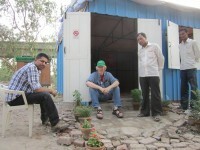 The other two shelters are also in areas where we have a large concentration of members in central Delhi one, a permanent building is near the Delhi Gate in the warren of narrow streets and slender alleys between the buildings of Old Delhi only feet away from the walled city and the Red Fort. 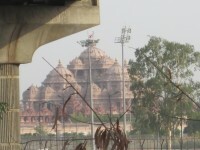 The other temporary structure is hardly a kilometer down the highway from the new civic center that houses the Delhi government and is near the old Azmeri Gate to the old city. Added together the centers we manage have a theoretical capacity of 250 men, but when the weather is cool, that number is always over 300 and sometimes close to 400 packed in every night. At first blush an organizer might think that this is a “captive audience” and the organizing could be layered casually across the time, but practically our centers in most locations go from empty to full up and force the work to be done “on the run.” Informal work is hard work at exceedingly low pay stretched over many hours. Our rickshaw pullers for example tend to not come into the shelter until after 11 PM when the last loads are driven from the Metro stops to homes. At 6 AM many are back up on the rickshaw pulling people to work and trying to string their money together for the day and pay the rent on the rickshaw to the owner. Every morning there is a time in each of the centers where our organizers read the daily paper to the men. The allotment of staffing on the contracts has allowed us to divide some of the hours into more people doing our community organizing work so that there is one organizer per shelter. Many of the men join the organization and are able to stay active and each center is a mini-office of sorts. 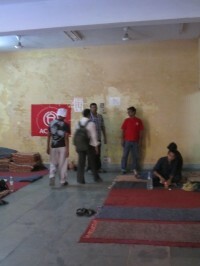 Capacity has increased for ACORN Delhi, but unfortunately there are only so many hours in the day. Years ago had we planned to run such shelters? No, absolutely not, but in organizing, you do what has to be done, and adapt the tools to the construction of the organization as they come to your hand, and that’s what Dharmendra Kumar and his team with ACORN Delhi have taken to task to move their mission. This entry was posted in ACORN International, Organizing and tagged acorn india, Akshardham Temple, Bengaluru, commonwealth games, delhi, Dharmendra Kumar, expressways, flyovers, homeless organizing, Income Tax Office (ITO) slums, India, Olympics, rickshaw pullers, shelters by Wade. Bookmark the permalink.